and you will have a healthy smile!! Witty World saw a flurry of dental activity, as little Wittians ranging from 2 to 5 yrs were taken batch-wise to meet their ,"Dentist friend" who examined their teeth and certified it too. The doctors also spoke to the children about the importance of good oral hygiene which will help their teeth serve them for a lifetime. 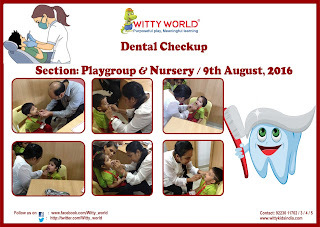 Teachers had already prepared the children for the Dentist's visit, and they were excited to meet Dr. Vivek Jalan, Dr. Shikha Jalan and Dr. Divya Shetty who conducted the check-up. 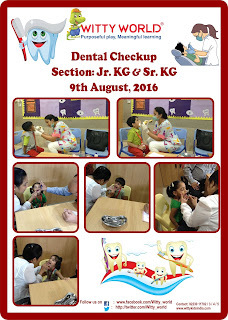 Here's looking forward to healthier smiles!! !